Calling all Greek Monogram Lovers!! If you are in a sorority on campus and love monograms - you would be CRAZY not to enter this giveaway!! We are giving ONE lucky chapter $1000 in MarleyLilly.com Gift Cards AND amazing shirts for your ENTIRE chapter! Split the money among your members or use it any way you see fit for your chapter! Your friends will thank you once you've shared all of our adorable Marley Lilly products with them. T-Shirt for every member in the chapter! Getting your chapter entered in this giveaway is as easy at 1-2-3! ONE: Fill in your information below. We will email you your chapter's unique link within 48-72 hours! Please check your SPAM folder for our responses, unfortunately our responses end up in MANY people's SPAM folders. The email will come from promotions@marleylilly.com! TWO: Forward our e-mail to your chapter's list serve! We know they will want to win Monogram Money and FREE T-shirts too! THREE: Share your Chapter's unique link with sisters, friends, family and basically everyone in your address book. The more people that click through your link and verify they follow Marley Lilly on various social media accounts, the better your chances are for winning! The chapter who receives the most entries on their unique link wins! The contest ENDS on Sunday, February 23rd at Midnight EST! We will announce the winners on all Marley Lilly social media accounts on Monday, February 24th! Please note that all entries will now have to be verified prior to this announcement. We've found that some users were entering fake email addresses (ie. edfdf@sdfd.com) and those entries will be deleted and disqualified. We have a meeting later today to determine if those chapters will be disqualified from the competition. Email marketing@marleylilly.com with questions. Not in a Greek Organization? 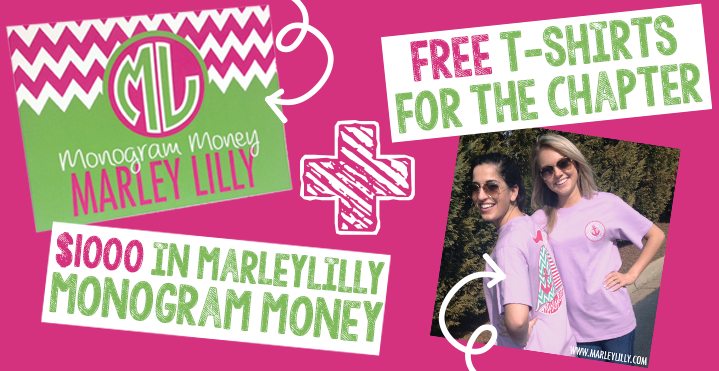 You can still enter to win FREE MONOGRAMS from Marley Lilly here! Rules & Guidelines: Once the winner is chosen, we will need to speak with a Council Member from your chapter regarding the gift card. The $1000 Gift Card to MarleyLilly.com can be split evenly between chapter members OR it can be broken down into various increments to be used for internal chapter giveaways and/or philanthropy events. Marley Lilly does not personalized items with greek letters, so the items purchased would either need to be blank or would have your monograms on them! The gift codes or code will be given to a member of your chapter leadership depending on how your chapter decides you want to break up the $1000 in Marleylilly.com gift cards. This giveaway is open to Chartered Greek Chapters only. We will verify the number of active collegiate members in your school's chapter before mailing the Sailboat Shirts. The shirts do not have monograms or greek letters on them, they are a promotional Marley Lilly shirt. We will need a list of sizes from you if you win the giveaway so we can make sure to get each girl her desired T-Shirt size! Edmond Jaeger made a terrific ultra-thin rank, and they inhibited Switzerland watchmakers to generate these. It turned out Jacques-David LeCoultre, Antoine's grandson, whom required task and became popular. Your LeCoultres produced their incredible view generating art know-how, even however Jaeger, a wonderful developer, provided her or his combined point shows an innovative fashion and that is the unshakable Jaeger-LeCoultre best replica watches UK brand. This distinct alliance presented climb to a collection of horological miraculous, and in addition in 1937 the actual Jaeger-LeCoultre style themselves. Each independently as replica Breitling watches well as jointly these adult adult men forged links replica MontBlanc watches by adding adequately acknowledged makers linked to luxury designer watches. Via 1902, after which it for a number of thirty several replica Gucci watches years then, replica rolex watches uk LeCoultre & Cie designed view movements intended for Patek Philippe involving Geneva. Ahead involving Jaeger and also LeCoultre initiated working jointly, Jaeger nowadays experienced around his clientele your renowned developer Cartier.